It's with great pleasure that I'm sharing with you today an interview I recently had with my dear blog friend and wonderful mixed media artist / doll maker Dorthe Hansen of Den Lille Lade! Dorthe makes the most beautiful mixed media collages, art books and fabric rolls. Mostly in a nature or shabby vintage theme. But many of us know her as a doll maker. And her dolls have such friendly faces, they immediately take you in. 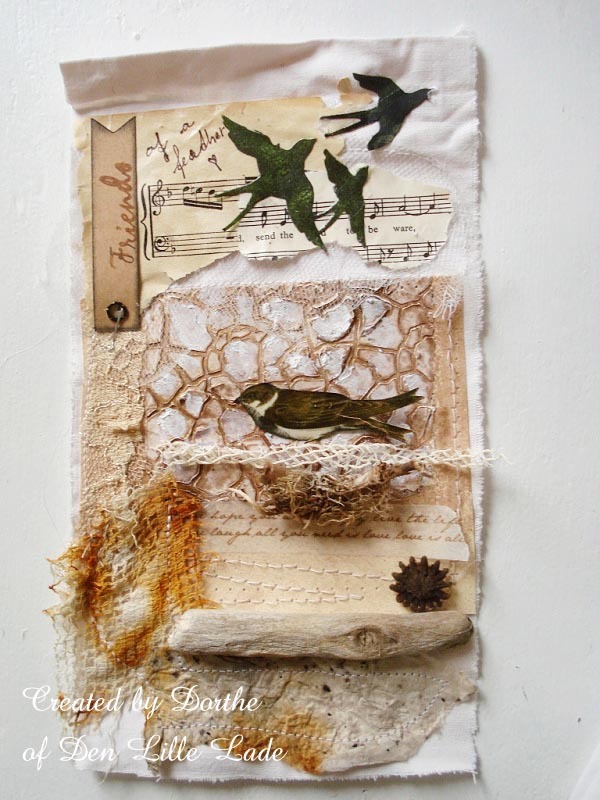 Dorthe uses old laces, hand dyed fabrics, papers, driftwood and other things she finds in nature. And with these items she makes unique, one of a kind pieces of art. Since she regularly participates in the Simply Neutral parties here on AppleApricot, I thought it would be wonderful if we get to know her a little better, and asked if she would like to do an interview. Luckily for us she said yes! So here it is! Wen: Hello dear friend, it is so wonderful to have an interview with you, thank you so much for your willingness to share your story with us! In case anyone doesn’t know you yet, can you tell us a little bit about yourself? Dorthe: First dear Wendy, thank you so much for doing this interview with me. I feel very honoured and will try to tell a little about my creative life. 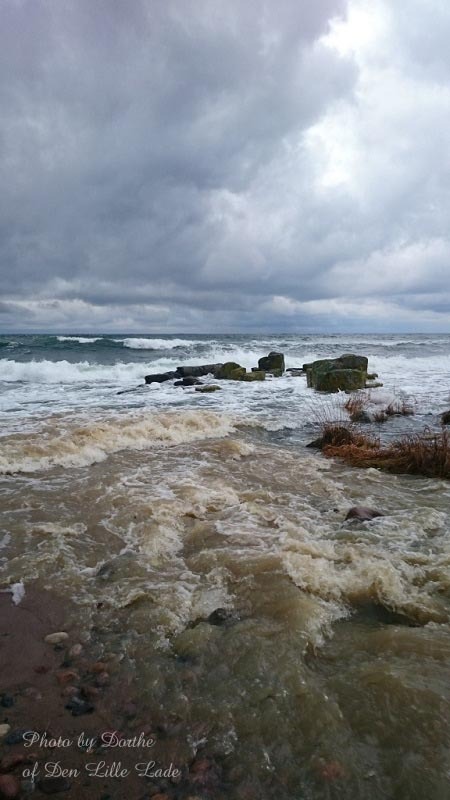 I`m a Danish woman, living on a tiny island Bornholm with my husband. I have a wonderful daughter, and two grandkids living far away, in Copenhagen, so the little time I spend, with them is precious, to me. I have always loved sewing, and have lived from sewing dolls and other things for 19 years, having had my shop on my home address. Now it is closed and I`m a pensioner :) with time to sew and create, whenever, and what I want. Wen: When I started blogging in 2012, you were one of the first artists upon whose blog I stumbled. And I’m so happy that I did this quite early! Because not only did I start blogging in 2012, but also crafting. And you were a great inspiration to me from the start. I learned so many things by just looking closely to your work. Dorthe: Thank you for your loving words, Wendy, I`m so happy to be able, inspiring, and I can honestly say, you have inspired me so many times, too. 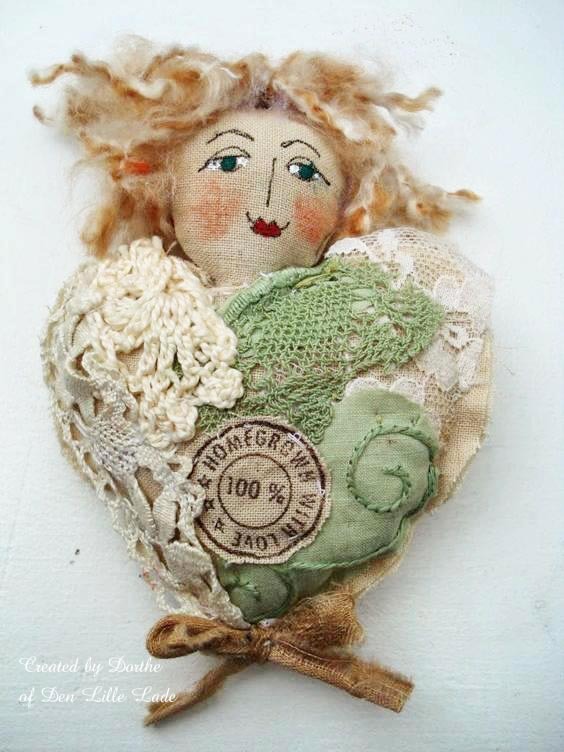 What made you become a doll maker / artist and who were your early inspiration and how has this influenced your work? My very early inspiration was an American man called James Cramer. He made simple style dolls and santas, and I still love what he did. He influenced my work, in the way, that he made me start creating myself, trying to find my own style. And later I “met” so many American women creating dolls of all kind, whom also inspired me, through the years. 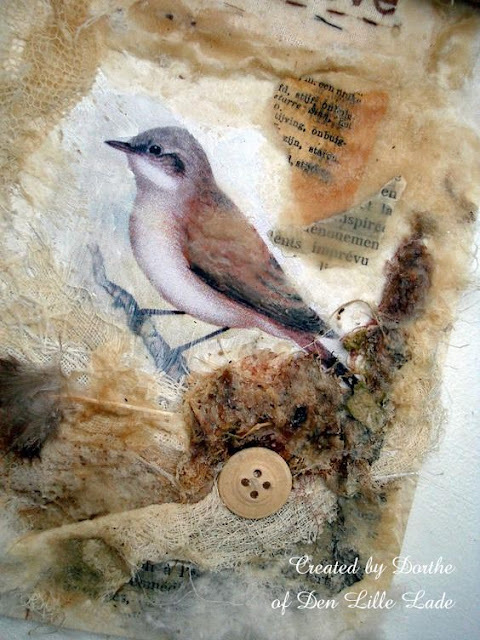 But the last many years I turned my interest into the mixed media world, and there also found lovely friends, -one I will always keep in my heart, is JoAnna Pierotti, whom both was a dear friend, and also inspired me very much ! RIP, to Joanna. Dorthe, how would you describe your art and your art style? I think I can do that in very few words, Wen,- Shabby, romantic, and always with a touch of nature. Also the dolls were romantic, fairies, and angels, cloth dolls. Some of my most favourite art pieces that you created, are the ones where you are inspired by nature. The use of found objects, driftwood, feathers. This has really inspired me to do the same. Nature has a big place in my creations, that is right, it also gives of its ridges of all kinds, and I can`t take a walk, without bending to collect all kind of materials: leaves, dried berries, cones, feathers ,driftwood, and much more. They are all saved, to get a place in a creation, later. What kind of art work do you most enjoy making? 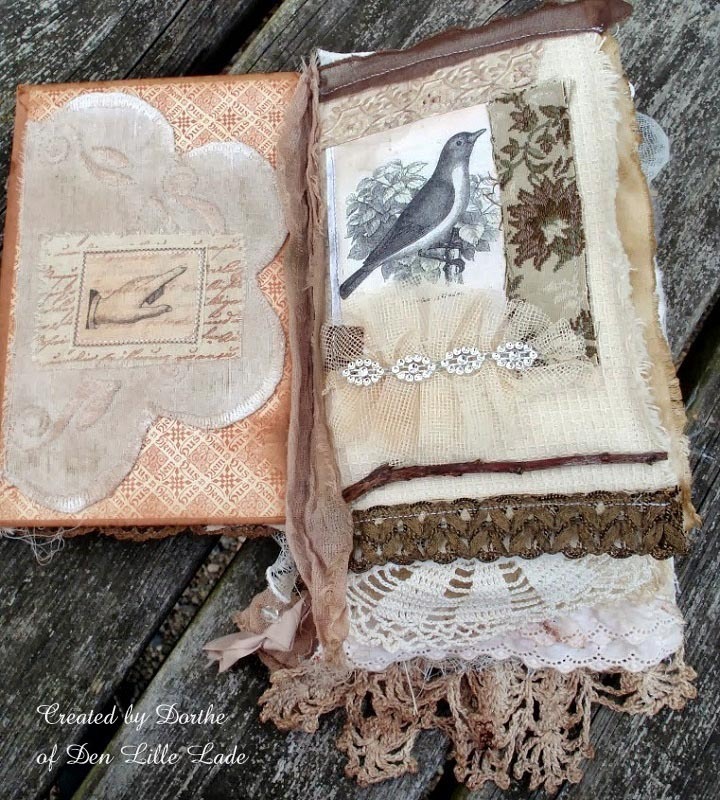 Now a day`s my favourite play is with both papers, and fabrics. 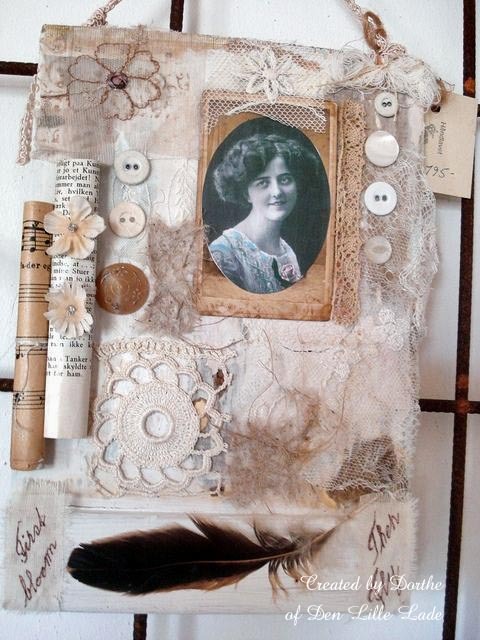 Creating collages, cards, tags, all kinds of things, where I can mix, all my finds, with papers and laces, old photos and ephemera. Can you tell us a bit about your process of creating? I don`t really have an idea, when starting, but chose stamps and other materials, at first, and only after that, I decide what the “big picture “ should be, and start creating. I get very inspired when having the materials in my hands, adding,-and taking away, till my eyes are satisfied !! Do you have a favourite material you love working with? I am almost sure I never did anything without using old laces, or other old pieces of cloth, somewhere in my creation. -I also collect beautiful old scraps, and ribbons, whenever I see them, and they are always a part of whatever I do. Are there materials you’d like to experiment with? Or creative styles you’d like to try? I would like to experiment more with eco dying! The results some people get from gathering leaves, and flowers,- rolling them up in cotton and after dye them in a hot, boiling bath, fascinates me, a lot. I have tried a few times, but never really studied the best procedure, and I believe one need to know exactly how to do it, to get a beautiful result !! 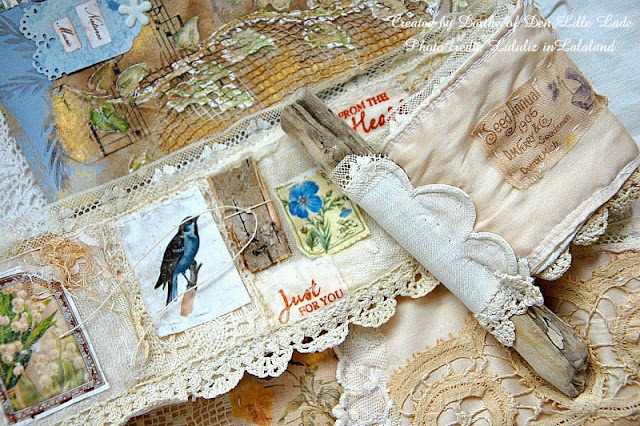 One of my favourite art pieces made by you, is a fabric and lace roll attached to a piece of driftwood, with bird images, which you made for Liz of LuluLiz in LalaLand. Thank you so much Wendy, I remember it well !! And I am not finished with creating snippet rolls, they are lovely little works, and can be done, while in the evening watching a bit of TV. Again I collect some different materials, and transferred images, and play, till I find the result lovely. Is there a piece of art you made that you are particular fond of? Why is this one so special to you? I actually don`t know, if there is a particular piece I could mention, but the dolls, the big ones, are always special to me. They grow and come alive through my fingers, and thoughts, while sewing. They are always very different, in appearance,- and even if trying I would never be able to sculpt two faces looking alike. That`s what makes doll making a bit like giving birth, every time finishing another one. The dolls you make are so full of character. How do you make them come to life? Do they have their own stories? Yes, they always have a story of their own, depending on which kind of doll I wish to create. I love becoming inspired from fairy tales, and lovely drawings, of princesses, mermaids, angels, musicians a.s.o. I collect materials, from my stashes, -I do like to use special fabrics, and for many years I bought samples from a Danish woman whom sold expensive fabrics, to well known fashion designers in Denmark. Every time she had a new collection, I could buy the old one, also laces, buttons, ribbons, and so much more, so my doll dresses were always made from very fashionable materials. The many tiny adds, maybe of a story, in her hand, a hat, the wonderful materials, always together with the face, made the doll almost live. The 3-d faces really adds to that feeling, I think. It is wonderful to hear you talk about your dolls and how you make them. 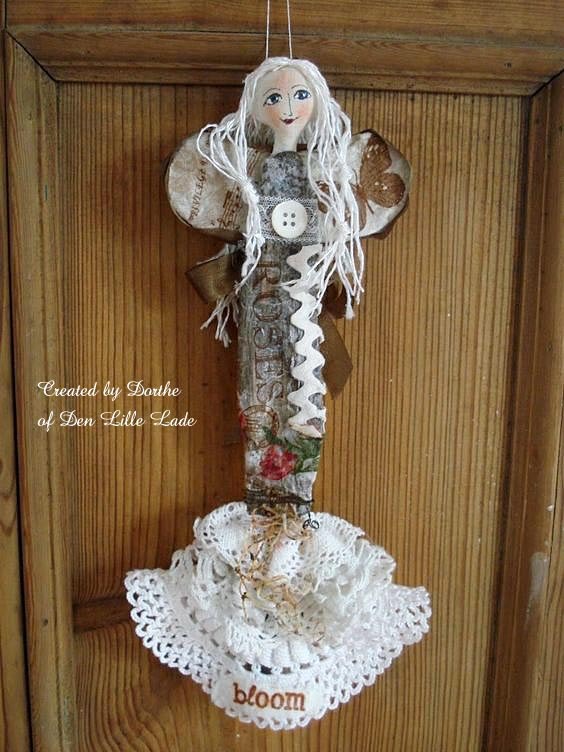 If you will ever do a workshop on making dolls, then I will certainly join! What really struck me from the beginning, is the generosity in the online creative world. I have met so many sweet and helpful creative bloggers, like yourself, who always have a friendly word to share, or who are there when you need help. What have you gained by joining the online creative community? In what way has it enriched your life? Oh Wendy, that could be another new story. I would never have believed, to receive all the support, the sweetness, the help, which have been showed me, from the land of blogs, and also after joining Facebook. I meet so many wonderful people, like you. Some have become close friends, with whom I can empty my heart, gain strength and celebrate, too. It has become a very important part of my life, which I never wish to loose. Also we are each others cheerleaders, inspirations, and uplifting, “sisters”. I always do my best to “pay back” all the kindness, helpful advises, smiles, and even love, I have received from so many places in the world, and I treasure all these dear friends so very much. Thank you dear, I feel really blessed to connect with you. You truly are an inspiration to me and a sweet friend! Is there something else you would like us to know about you or your work that we have not covered? I think we have been around, of course there would be other things to tell, but I believe this interview have become very long, LOL - Thank you for reading my thoughts, and stories from life, I am thankful, to have been chosen, to be here. You're so very welcome, and thank you so much for sharing with us your story and thoughts, dear friend! Photos taken by Dorthe of Den Lille Lade and Liz of Lululiz in Lalaland. Used with permission for this interview. Oh Wendy, you did a marvelous job, finding art pieces made by me, over the years , to illustrate the interview. So beautiful done by you, dearest friend. Thank you for making this lovely and thoughtful questions, followed by my answers, to another more rich story, for the visitors, to read and watch.You are such a wonderful friend, and I thank you again, for choosing me to your first interview ,here. It is an honor, and a beautiful gift to me. YOU so deserves an interview yourself, for all of us to read about your amazing creative life . You are such a talented and lovely artist and friend. Wen, dearest,- You have a beautiful, and happy summer. Take care dear sweet friend , I look forward seeing wonderful photos and read beautiful stories about your mountain tour !! Thank you for interviewing and showing one of my favourite artists and friends. 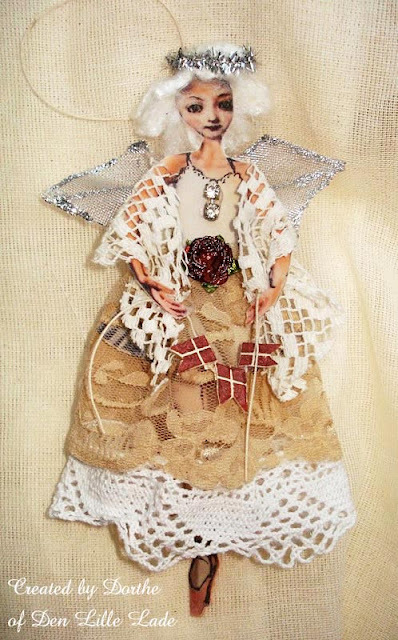 I too adore Dorthe and her gorgeous dolls and beautiful pieces. Thankyou so much dear June, for your loving words. I treasure your art and friendship too. I thoroughly enjoyed reading the interview you did with Dorthe. You both are incredibly talented artists and I find myself totally mesmerized by your work. I love scrolling through the photos you both post and studying every sweet little detail. 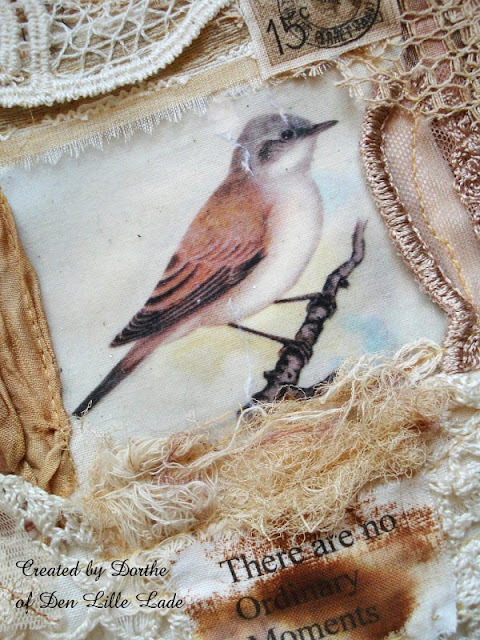 These photos of Dorthe's art are all so beautiful and inspiring. 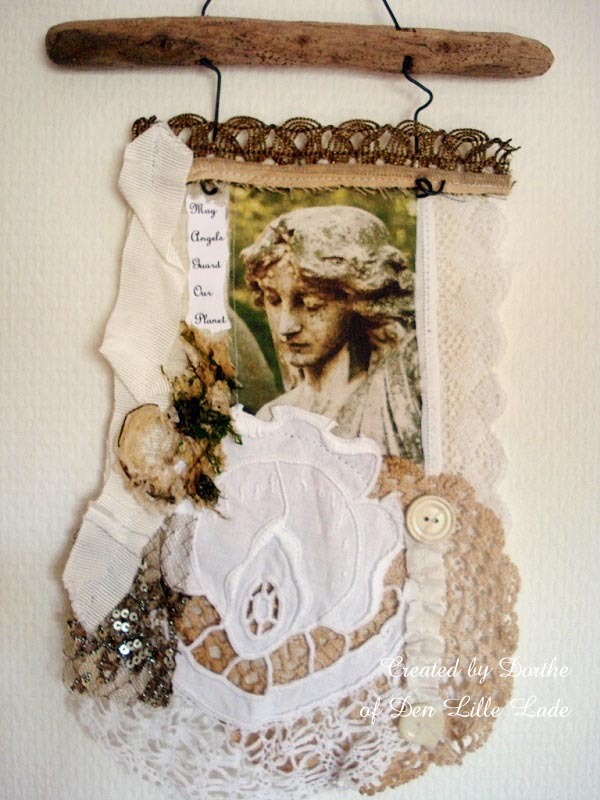 Though I love to create using many different styles, my true love is the shabby, romantic style too! Using lots of lace, old lace! Thanks Wen for this wonderful blog post! Thank you for the beautiful interview of my dear friend Dorthe! She is the sweetest soul and such a creative being. I love all her dolls (have many) and her natural artwork. I feel so lucky to know Dorthe. Oh my dear Terri, thank you from my heart, you are a precious friend, to me, and I so love your art, and you. Thanks for giving a glimpse at the wide array of Dorthe's work. It's all so lovely and inspiring. I so enjoyed this Wen - I have heard about Dorthe and seen her work pop up in places around and about the internet but have never 'met' her. Now I plan to sneak a peek at her blog and will probably become a follower. Thank you! Heerlijk om te zoen, al die romantische creaties!! What an incredible celebration of Dorthe and her wonderful art. 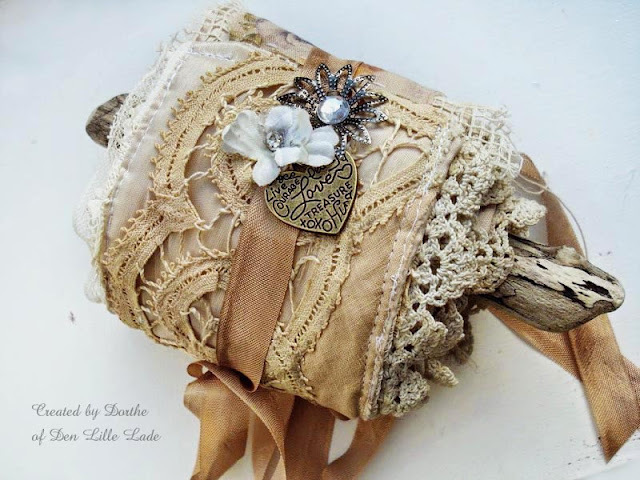 Dear Wen ~♥~ What a brilliant choice to interview the talented and loving Dorthe! 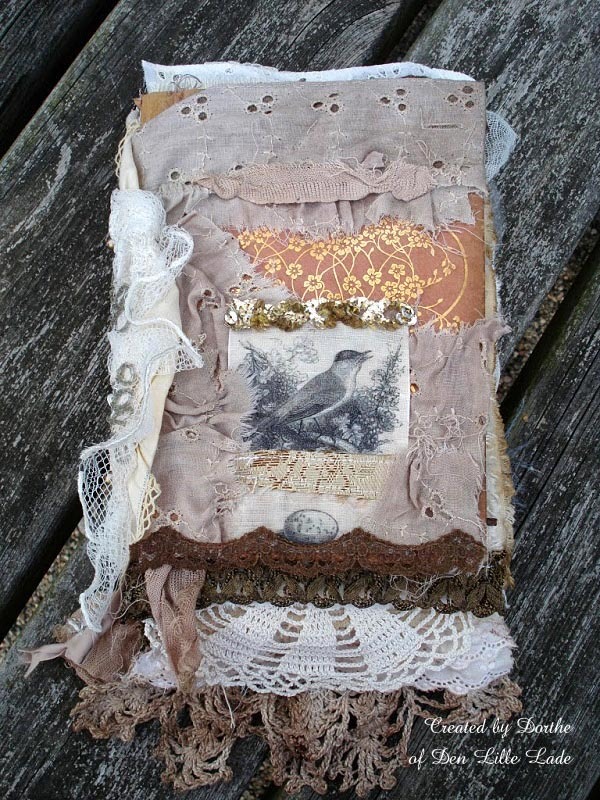 It was very interesting to read and see more of Dorthe's wonderful creations too. You both did a very fine job of asking and answering. Dear Patty, thank you so very much , Wen, did a most wonderful job ,and I only answered her questions :-) She is a lovely and wonderful friend. Dear Wen what a wonderful idea of yours to organize this interview with dear Dorthe! and hopefully more artists in the future. It truly is a wonderful way to get to know these talented, admired and inspirational artists. I personally have had the pleasure of a special friendship with her now for a number of years and it means so much to me! Her doll making skills are so beautiful and unique as well as her many other talents incorporating a wide collection from nature. She is one special person who brings so much joy and inspiration to so many! Thanks again Wen for allowing us to know even more about this lovely lady! Summer hugs and love until August arrives again! Hi Wen...what a wonderful post, it's been lovely reading your interview with Dorthe and l really loved the questions you asked her. Dorthe gave us a lot of insight into her creative processes and the materials she uses as well as who her influences are...l can understand how living on an island and being surrounded by the sea, sky and nature would greatly influence her work. I also visited Joanne Pioretti's blog, what a sad story, my heart went out to her as she wrote about her years and final months living with cancer, but l loved seeing her creations both on her blog and on pinterest...it's so great her work can be honoured and remembered here. 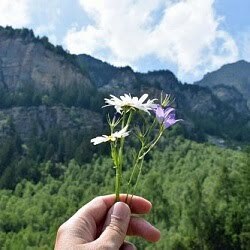 Yours and Dorthe's knowledge and creations will continue to inspire and influence all who read your blog. Thank you for sharing. 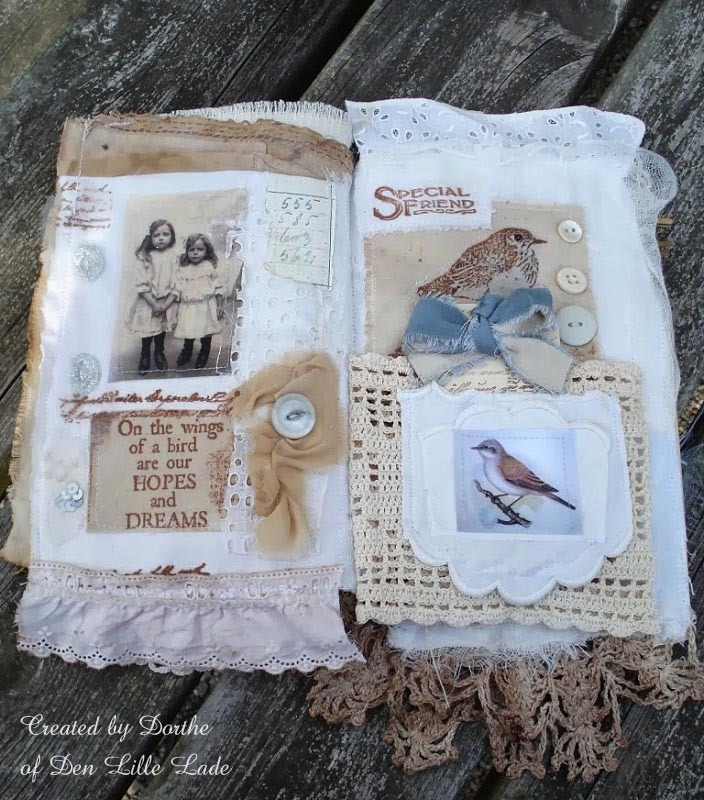 Such Beautiful work, Dorthe is very creative and talented, great idea for the interview!! I really enjoyed reading the interview you had with dear Dorthe and she is such a talented, inspirational and beautiful friend to us all. The gorgeous green bird she made me has a special place in my home and I feel very lucky and honoured to have this. Lovely to meet you too and discover you and your lovely blog. Thanks for sharing this great interview. waue I enjoyed reading the interview, great with lovely photos of her doings. Dorthe is very talented and very creative person. Hi Wen, so nice to meet you and wonderful to see dearest Dorthe showcased here in this interesting interview. Her work is outstanding and I love all that she creates. She is an amazing talented and one of the nicest friends in the blogland community. Her endearing ways make her someone very special. I think that's why her designs are so special because they reflect her beautiful heart. Thanks for sharing and again so nice to meet you. Hello Wen, what a wonderful interview with Dorthe - it's a great idea help us all get to know the people behind the blogs and the precious artworks they create. Dorthe's work is such an inspiration, and you are so right- her kindness comes through in every comment she leaves. What a talent she has for combining so many elements in her work. I love the natural 'found' elements especially. I just enjoyed my morning coffee with you both,wen & Dorthe and had the most wonderful time! To you both, Wen and Dorthe, congratulations on a really wonderful interview. Dorthe is an amazing person with the most generous heart and the most wonderful gift of creating beauty. I am so lucky to be able to call her a friend and to have so many of her creations, some in the UK, some in the cottage here in France, and some which travel with me between the two because I can't bear to be parted from them. Thank you so much, Wen, for this beautiful post. 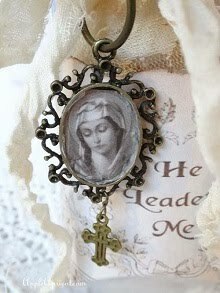 This was a wonderful post which I enjoyed reading and looking at the pretty creations. Thank you so much! héél interessant! bedankt voor dit artikel! What a beautiful way to end my day, spending the time reading this most special of interviews. Wen, you asked the questions many of us would wish to ask dear Dorthe. Dorthe's connection with nature has been such an inspiration for me as she has kindly, time after time, gifted me with driftwood from her walks along her beloved beach. 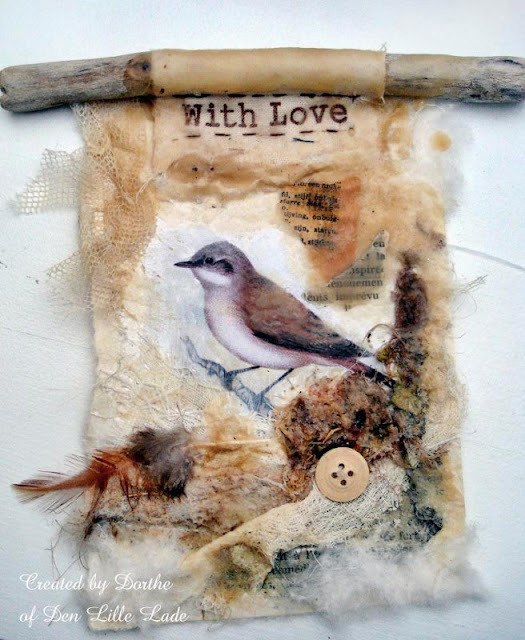 Dorthe's connection with nature, with Mother Earth shines through with the elements she includes and also her choice of imagery whether it be stamped or image transfer and as for her dolls, they are the most precious. To have possession of Dorthe's art is something I feel so honoured to have and equally, I am so honoured to have this friendship of a woman who is so kind of heart and so generous with her friendship, with her time, her support, her encouragement and her gentle ways. All our lives are enriched for having Dorthe in them. Echoing so many of the comments above, particularly Lynne's thoughts about how Dorthe works with natural elements - it's wonderful to read such a beautiful interview with a beautiful soul.